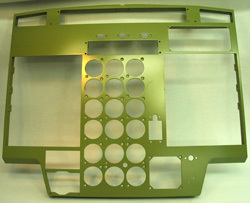 A PMA aircraft center insturment panel milled from a 3" single piece of aluminum. Nearly 30 years ago, Duncan Aviation was given its first aircraft Parts Manufacturer Approval (PMA) authorization by the FAA, allowing us to manufacture aviation-related parts intended for installation on an aircraft. These aircraft parts are typically no longer available, extremely hard to find or one-of-a-kind items. A PMA is not just an approval of the aircraft parts manufacturing process itself. It is the FAA’s approval to manufacture specific aviation-related parts. It is issued for the production of modification or replacement parts, which includes materials, parts, processes and appliances. Gaining the FAA’s approval is not that simple. In all cases, we must first prove we have the capabilities to produce the aircraft part and have a quality system in place to consistently produce these parts to the design specifications and airworthiness requirements. This includes ensuring traceability of each part throughout the entire process. There are four paths to seeking FAA approval and ultimately gaining a PMA aircraft parts approval. Typically, approval of major changes in type design of an aircraft is obtained in the form of a STC. To gain PMA through a Duncan Aviation-owned STC is the path of least resistance. Since parts are already designed and approved, we just verify our manufacturing capabilities to produce these parts to the FAA-approved design certificate. But what if we don’t own the STC? On occasion, we obtain a PMA using the design data from another company who owns an STC for the part we want to manufacture. We enter into a license agreement to manufacture the parts with our PMA capabilities in accordance to their design. On occasion, the original design data may not be available to produce the part. If we can design a replacement part and show that our design and manufacturing capabilities will produce the part identical to the original approved part, we can obtain PMA based on Identicality. Our efforts through Identicality must prove our design and produced parts are identical in all aspects, including function, dimensions, materials, etc. The advantage to PMA by Identicality is that the certification and approval process is much less involved than by Test and Computation, but in most instances it is difficult to prove identicality. If we are unable to show Identicality, we can still obtain PMA by Test and Computation. In this case, we are creating and presenting new design data similar to, but not exact or identical to, the original design. We must substantiate our design through test and/or computation methods, similar to an STC. To test parts, they are put through the paces under different conditions to show the new design data is airworthy and in compliance to the regulations. Computation is accomplished through examination of the design through research and statistical analysis. Duncan Aviation provides quick-turn aircraft parts manufacturing solutions to OEMs, government agencies and aircraft operators worldwide, offering full support from concept through engineering, fabrication, inspection and delivery. Duncan Aviation holds many FAA pma part approvals, specializing in rare, discontinued and one-of-a-kind business aircraft parts. For a complete list of parts available through Duncan Aviation’s PMA authorization, consult the FAA’s Regulatory & Guidance Library, or call me at 402.479.1541. Jim Ferguson, Duncan Aviation's PMA Administrator at the Lincoln, NE, location, oversees and coordinates all PMA activities and approvals working directly with the FAA. His aviation career began in 1979.